Soccer teams depend on their trusted keepers to handle the ball with confidence. Gloves are a goalkeeper's most important piece of equipment. The right ones should not only protect his or her hands, but support their performance. But shopping for them can be a little confusing. If you're a first-time goalie or looking to upgrade, a little goalie glove know-how will take the edge off shopping and on the game. But remember that while a great pair of goalie gloves are essential to your performance, they're no substitute for proper training and technique. Things to think about when shopping for goalkeeper gloves? Selecting gloves to suit the weather? What you should know about finger protection soccer gloves? Important considerations in choosing the right gloves are size, cost, type of glove, and whether you'll need finger protection. And after you've purchased your gloves, you'll need to know how to care for them in order to get the most out of them. Unlike most gloves, goalie gloves fit a little loose and so they're sized a little differently. A slightly larger glove will not only perform better, it'll last longer. Just how large is debatable. It really comes down to you, and what feels right. Too small or too floppy not only damages the latex, it can affect your performance. In general, gloves should be snug enough to prevent your fingers from slipping in them when catching the ball, yet loose enough to not put stress on the seams and materials. 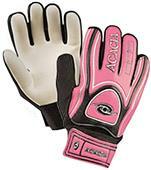 Goalkeeper gloves are sized numerically starting with youth size 4, on up to adult size 12. Companies may offer suggested sizes on the packaging based on age, height, or hand measurements. Charts should serve as a general guide. Be aware that every manufacturer's sizing is a little different, and age and height are not necessarily good measures of a goalie's actual hand size. It really comes down to fit and feel. If you're a first-time goalie, it's a good idea to measure your hand. The ultimate way to know is by trying them on! Measuring the hand. Size can be determined in a couple ways, one is to measure the length of the hand in inches, from the base of the palm to the tip of the middle finger. Round off to the nearest inch, then add an inch. This is one way to get your approximate size. The other is by circumference. To determine the circumference of your hand, wrap a tape measure around the widest part of the palm just below the knuckles, excluding the thumb. Round the number to the nearest inch and add one inch. For instance, a hand measuring 6.7 inches would be rounded to 7 inches. Your glove size would be 8. Be sure and measure both hands, and go by the larger of the two. Either of these two methods will put you in the ballpark of your goalie glove size. Though technologies, materials, grades of latex and other features vary, there are basically three cuts of soccer goalie gloves: flat, roll, and negative. Flat. Some keepers call it "box cut". This is the older, more traditional and widely used type of glove so-called for its squared fingertips. Seams are stitched on the outside in such a way as to flatten the under sides of the fingers and palm area to follow the curvature of the ball. It's also a looser fitting glove. Roll finger. This increasingly popular cut still features the outside stitching, but fingers are shaped roundish on the undersides as opposed to flat. The glove feels snugger, and wearers say it offers a little better feel of the ball. Negative. Unlike the other two styles, the seams are on the inside giving the fingers a little more stability inside the glove. This is the snuggest fitting glove, and tends to be favored by goalies with thin fingers. This style does a particularly nice job of supporting a young goalie's technique. Other differences involve materials, technologies, and grades of latex. Materials. Goalie gloves are made from a wide range of materials, from latex, to polyurethane, to artificial leather. Backings are made from a variety of materials from cool and breathable mesh for hot and humid days, to fleece for chilly climes. Technologies. Goalie gloves incorporate many new technologies to keep athletes and manufacturers on the cutting edge of the competition. High tech cooling systems, enhanced grip and shock absorption, finger protection, pre-curved ergonomic designs, closures that offer additional wrist stability, you name it. There is definitely something for everyone in a soccer goalie glove. Latex. The palms and undersides of the fingers come most into contact with the ball, and latex material best supports these areas of the glove. Latex allows the glove to grip the ball, and underlying foam material provides shock absorption. Latex gloves vary in thickness from 3-4 mm. The softer and thinner the latex, the better feel and grip on the ball. The only caveat of having very thin, sensitive, high performing latex is that the gloves are not only the most expensive, they wear out faster and have to be replaced more often. Whereas cheaper, more durable gloves made of denser cheaper materials may not let you 'feel' and grip the ball as well, but they'll hold up longer. This is where you'll need to decide whether your priority is durability or performance. Typically, the cheaper gloves make ideal youth and training gloves. Later, a serious goalie might upgrade to high end gloves that perform better. Closures. Without a way to secure the glove to the hand, it won't fit or perform right. Common closures include elastic, slit wrists, velcro, wrap, and bandage. Each have their advantages. High end gloves tend to feature wrap or bandage closures, and youth gloves tend to have elastic and slit wrists for easy removal. It's a matter of choice. These days, there's a goalie glove for just about every climate and terrain. Some gloves perform better than others in hot, cold, dry or wet conditions, or on hard, loose, and artificial turf. If you cannot afford more than one pair of game gloves, you may opt for all-weather, suitable for most conditions. The packaging should say what kinds of conditions a glove works best under. Most goalie gloves today feature various types of built-in finger protection intended to reduce stress on the hands. They're called different things by different companies. Basically, little plastic strips or spines are built into the glove to support the fingers and prevent them from bending backwards. Just about every glove features them and after all, manufacturers have to compete with the industry. Unless you're at risk of repeating a finger injury or need the extra protection, they really aren't necessary. In fact, some trainers feel they discourage the development of the musculature and technique needed for great goalkeeping, which can go a long way to preventing injuries. Be sure to use finger protection gloves in tandem with proper training. High tech gloves are no substitute for a high level of skill. Without proper care, latex goalkeeper gloves can dry out, crack, and not perform as well. Here are a few tips for making the most of your new goalie gloves. Clean after every game to remove dirt, sweat and odors that can break down the latex, and damage your gloves. Clean goalkeeper gloves work better and last longer. New goalkeeper gloves may be a little stiff at first. Broken-in gloves will feel more comfortable, and perform better. Of course, they're going to break in naturally as you wear them. But here are a few ideas for getting them game-ready. What are soccer goalie gloves made of? Palms of goalie gloves are made from various grades of latex, a natural substance derived from the rubber tree that give goalie gloves a tacky grip. 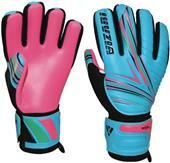 Many goalkeeper gloves are made from a synthetic resin called polyurethane (PU), and leather-like materials. How long will my soccer gloves last? It will depend on the type of glove, how hard, and how often you play. With routine care and normal use, a pair of high-performing soccer goalie gloves should last up to 15 games or more. Denser, more durable latex gloves might last you a couple seasons. Showing signs of wear? Don't throw your old gloves out, keep them for practice! How can I tell cheap soccer goalie gloves from good ones? Contrary to what you might think, when it comes to soccer gloves, durable doesn't necessarily mean better. In fact, the stronger the glove the more likely they're made of cheaper materials, and the less 'feel' on contact with the ball. With softer high-end gloves you trade durability and longevity. So in choosing a glove, decide whether durability or performance is more important at your, or your child's stage of the game. Generally, cheaper gloves make great starter, or practice gloves. When should I replace my goalkeeper gloves? Depending on the quality of glove, and how well you've cared for it, you might begin to notice signs of wear after about 15 games. The latex feels dry, gloves are not holding their shape, or seams are coming apart. But don't say goodbye to your old worn-out goalie gloves yet, keep them for practice! If you're a soccer goalie, you know that your most important piece of gear are your goalie gloves. They help you perform, and they protect your hands. But shopping for them may not be easy. There are about as many different soccer goalie gloves as there are goalies, playing surfaces, and weather conditions. Knowing which ones are right for you can be difficult. But with a little glove know-how you'll find the perfect match, for your next match. But remember, as much as a great pair of goalkeeper gloves can enhance your game, they're no substitute for proper training and technique. 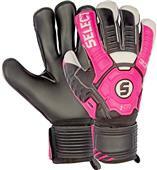 Epic Sports, Save 20% to 60% on discount soccer goalie finger protected gloves, training gloves and professional match gloves from sondico, reusch, epic, admiral & diadora.